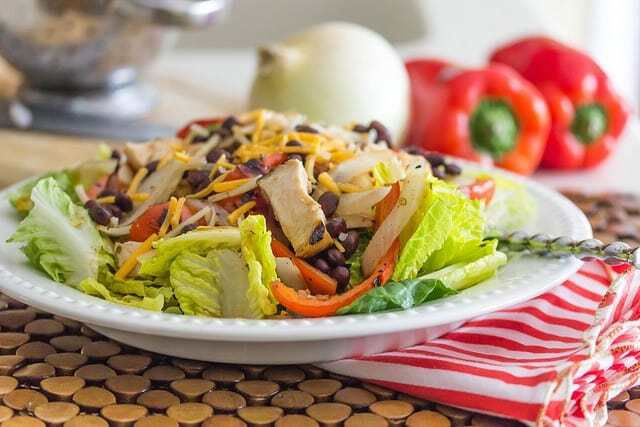 I’ve been trying to recreate a Mexican salad that I get whenever I go to the restaurant Chipolte. It’s sooo good – I love it. It’s healthy too! I think one of the major differences between my most recent homemade version and the restaurant version is that they shred their chicken and other ingredients more than I did here. Next time, more shredding! I found a great recipe for the dressing, which is supposedly as close to the authentic version that I’m going to get because the real deal involves some kind of prepackaged mix that is prepared especially for the restaurant. It’s all good though because I’d rather use fresh ingredients whenever possible. 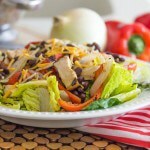 The salad is just as good without the chicken, so vegetarians can definitely partake in this dish. A couple of important ingredients that I forgot to include were guacamole and sour cream! In a small food processor, combine all the salad dressing ingredients except for the oil. Add the oil in a thin stream while processor is on high speed.